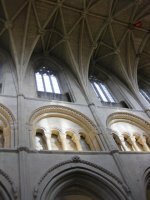 The Come Holy Spirit prayer is one of the daily prayers which I committed to saying to build my faith when living with very severe Myalgic Encephalomyelitis/CFS. The Come Holy Spirit prayer is among the common catholic prayers. It is a prayer I know from childhood. It is such a powerful prayer and in my view is not said enough in Christian churches. It was in an evangelical church that I learned once again to pray to invite the Holy Spirit to flow in me and in my life. I am very grateful. Are You Willing To Be Important? Are You Willing To Be Used By God? The original prayer to the Holy Spirit above uses the words "Fill the hearts of your Faithful... Kindle in them". By doing so it gives me the option not to be amongst "the faithful". Below, I adapt the prayer to say "kindle in us" instead of "kindle in them", so as to invite the Holy Spirit to flow in me. Bible stories tell us that those who are called by God typically object, saying they are too small. Moses, Saul, David all think God has made a mistake in choosing them! It is important that whatever our doubts about our suitability, we invite God to flow through each one of us. It is important that I invite God to flow through me. The Bible also says: "many are called but few are chosen". "All are called but few choose to listen." Therefore, they do not choose right. We can choose right by inviting the Holy Spirit to fill our hearts. We can let go of trying to do it all ourselves. We can connect to God and allow the Holy Spirit to enter the world through us. I adapt the Holy Spirit prayer with words to affirm that this renewal is taking place right now. "You (the Holy Spirit) ARE renewing the face of the earth." As you send forth Your Spirit we are recreated. To make the Come Holy Spirit Prayer even more personal, I sometimes replace “us” with “me”. Kindle in me the fire of your love. Whoosh, that is a powerful invitation to the Holy Spirit to work in me. Alternatively I insert into the prayer the name of someone I am holding up in prayer in faith to God. Come Holy Spirit, fill ________'s heart. Kindle in her/him the fire of your love. Inviting the Holy Spirit into someone's heart is a powerful prayer for blessing another and holding a vision for them to experience God flowing in their life. Prayer really is such a confirmation that we are One in God. When I include someone else's name, I feel the Holy Spirit prayer just as powerfully for myself. This prayer to the Holy Spirit can also be used as a great forgiveness exercise. Instead of filling your mind with thoughts of what they someone has done to you, you can ask the Holy Spirit to work in this person and hold a vision for their ability to receive the Holy Spirit in their life. Recently I have been putting in the name of someone I feel some anger towards. I feel my resistance to doing so. It feels very powerful and helpful to affirm that the Holy Spirit flows in this person and uses them for good. This prayer to invite the Holy Spirit and another one from A Course In Miracles have been hugely important to me. Back in about 2002 I started to have such a joyful overpowering experience of Spirit. Some years later, in February 2007, I had a profound spiritual experience. For three days I was full of the Holy Spirit, and laughing. At the time I was severely disabled and had a very difficult life. In this world there was not much to laugh about. But I laughed and laughed at the beauty of it all. I feel that that laughter has never quite left left me. I often feel other less enjoyable emotions! But the laughter is there bubbling behind the surface appearances of this life. I say this Holy Spirit prayer often. One of the last verses in the Bible is about the Holy Spirit. These bible verses are possibly part of the origin for the Holy Spirit prayer. I love that. Are we willing to take the water of life freely? If so, let us say this prayer of invitation to the Holy Spirit. Come Holy Spirit, fill my life. Please flow through me into the world. A prayer to the Holy Spirit is a powerful prayer to invite God into our life. 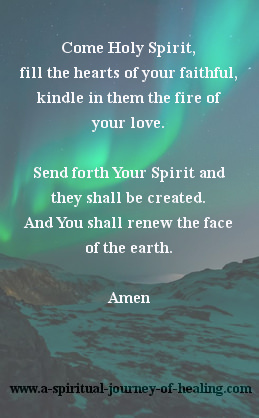 Another Bible verse about the Holy Spirit which serves as the origin of this prayer are the words of Psalm 103.
and renew the face of the earth"
Move from the Holy Spirit Prayer back to see the full list of inspirational prayers on this website. 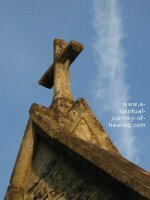 Move to the home page - Practical Spirituality and Healing.